Connor Prince are pleased to offer this completely refurbished three bedroom semi detached extended family home with two reception rooms, fitted kitchen with appliances and southerly aspect rear garden. 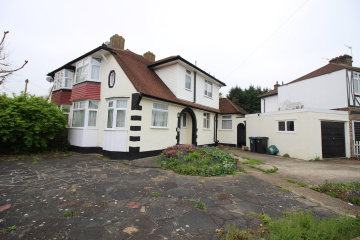 Situated in a residential no through road close to sought after local schools, shops, bus stops and within half a mile of Worcester Park's mainline station giving access to London Waterloo. Wood flooring, built in cupboard, double radiator. Three double glazed windows, wood flooring, T.V. point, two double radiators. Refitted range of high and low level cupboards and drawers, roll worktop surfaces, inset single drainer stainless steel sink unit, one and a half bowls with mixer tap, built in four ring gas hob with extractor hood above, electric oven below, fitted fridge/freezer, plumbing and space for washing machine and dishwasher, breakfast bar, double glazed double aspect window, part tiled walls, cupboard housing gas central heating boiler, tiled floor, double glazed door to garden. Low level W.C., vanity wash hand basin, heated towel rail, tiled floor, double glazed window. Wood flooring, double radiator, double glazed window, built in cupboards. Into angled bay double glazed window, double radiator, built in wardrobes, built in large eves cupboard. Built in wardrobes, double radiator, double glazed windows. Double radiator, double glazed window, built in shelved cupboard. Refitted white suite comprising panel enclosed bath with mixer tap and shower attachment, vanity wash hand basin, low level W.C., double glazed frosted window, heated towel rail, fully tiled, shelved cupboard, medicine cabinet. Lawn and patio areas, timber garden shed, side access enjoying a southerly aspect. 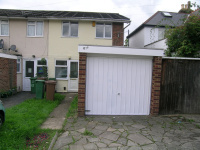 Light and power, personal door to rear garden approached via own driveway, providing additional off street parking.